Where people live can affect their health more than they realize. Air pollution is often worse in low-income areas compared with wealthy neighborhoods. Residents of Robeson County in North Carolina have lower household incomes, poorer air quality, and worse health than average for the state. American Indians, mostly of the Lumbee Nation, comprise more than 40% of the county’s population, and Lumbee women have the highest death rate related to heart disease in the county. Jada Brooks, Ph.D., M.S.P.H., RN, a former NIMHD Health Disparities Research Institute Scholar, is investigating this health disparity from an environmental, social, and individual standpoint. 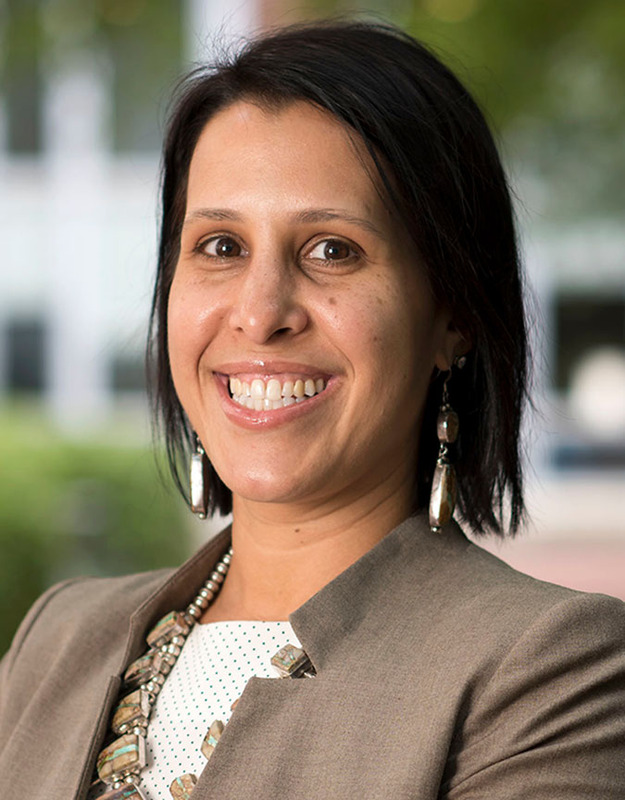 As an assistant professor at the University of North Carolina (UNC) at Chapel Hill School of Nursing, she studies how air pollutants and psychological well-being (subjective well-being and mental health) affect heart disease risk among American Indian women in Robeson County. Dr. Brooks has received support for her 5-year study, now in its third year, from the National Institute of Environmental Health Sciences and the NIMHD Loan Repayment Program. Other studies have shown that air pollution may worsen existing heart conditions and contribute to the development of heart disease. In addition, limited evidence shows that having positive mental health—“a positive psychological state”—can help reduce the inflammatory effects of air pollutants. With this background information and an interest in the environment, Dr. Brooks focused her project on studying whether air pollutants increase inflammatory responses involved in heart disease and whether a positive perspective could potentially counteract the inflammatory response in American Indian women. Prolonged stress itself can lead to increased inflammation in the body with elevated stress hormones; it can also result in high blood pressure and unhealthy behaviors, such as poor food choices and tobacco use, which may cause further inflammation. Inflammation is part of the body’s immune response to infections, toxins, and tissue injury. Long-term inflammation, though, can damage the body, including the heart and blood vessels. Doctors often recommend blood thinners and anti-inflammatory medications for people at risk of heart disease. However, a positive mental health state and good coping skills could also help to reduce inflammation and the risk of heart disease while controlling stress hormones and lowering blood pressure. The study led by Dr. Brooks will include 150 American Indian women ages 18 to 50 in Robeson County. Participants will complete surveys on their mental wellbeing and also have blood tests for markers of inflammation. In addition, the research team will assess the women’s exposure to air pollutants. The goal is to detect any links among these variables—for example, the team might find blood test results showing higher inflammation in women who inhale a lot of air pollutants and are under a lot of stress. The research team will also be working to develop ways to engage the community while helping women understand relationships between air pollution and heart disease. Dr. Brooks has a mentoring team from multiple disciplines that gives her guidance on measuring and analyzing air pollutants, psychosocial factors, and blood markers of inflammation. She has been working closely with her colleagues at UNC Chapel Hill, including Barbara Fredrickson, Ph.D., a psychologist who runs the Positive Emotions and Psychophysiology Laboratory (PEP Lab); psychiatric nurse Linda Beeber, Ph.D.; and Giselle Corbie-Smith, M.D., M.Sc., the director of the UNC Center for Health Equity Research. David Peden, M.D., M.S., a UNC pediatrician working with the Environmental Protection Agency, also helped to initiate the project. Several obstacles, including Hurricane Matthews and a lengthy approval process, delayed the start of the project by 6 months. However, enrollment for the study is more than half complete. Dr. Brooks attributes this success in part to the notion that the community members are concerned about their health and trust her as a Lumbee researcher. Dr. Brooks has established partnerships with Southeastern Health and the Lumbee Nation of North Carolina. As a recently selected member of the UNC Thorp Faculty Engaged Scholar Program, which provides funding to support faculty and community partnerships and community-engaged projects, Dr. Brooks hopes to help her existing partners integrate findings from her research into practice. “This way, the benefits are sustained over time, and the reach is amplified to a broader audience,” she says. By increasing the community’s sense of positivity, further research efforts may reduce people’s risk of other chronic illnesses as they learn to cope with environmental and social stressors that they cannot always control.